We offer these only as a consequence of requests for even less expensive kneelers (once the cost of shipping is added, we make almost nothing on them). But if cost is the issue, then we don't know where you can get a kneeler of equal quality for less... unless you make it yourself. However, shipping times can vary significantly, and some of them do go on backorder. Please see the individual descriptions, below. If you order one noted as out of stock when you placed the order, and later cancel that order, there will be an order management fee equal to approximately 10% of the original order. Also, these sometimes (rarely) arrive broken. If this happens, please place the kneeler back in the box, tape it up and notify us. 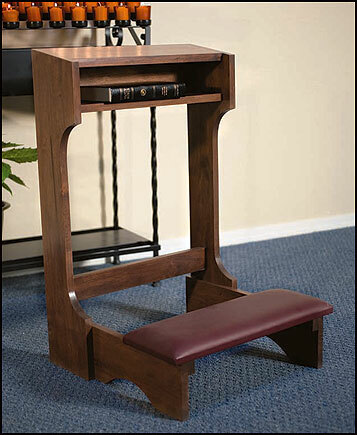 We will have the shipper pick up the broken kneeler and ship a new one to you at no cost to you. In some cases we have offered to fabricate replacement parts but it is usually best just to ship you a new one. On hand at last check. 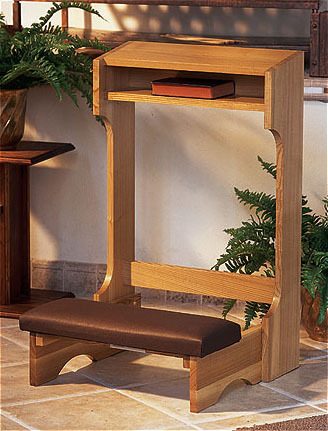 The folding kneeboard makes this an easy kneeler to store away or travel. 20 inches wide and 32 inches tall. $240 delivered to most USA addresses. WALNUT Alternative: The exact same design is now available for the same price, but with a darker, walnut colored finish over maple. On hand at last check. 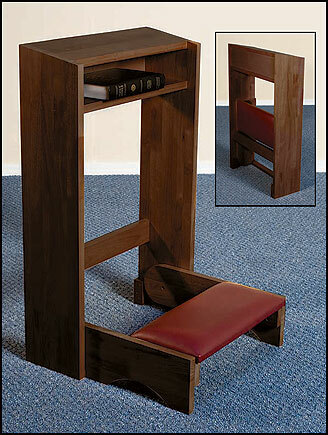 This kneeler has a fixed kneeboard -- it doesn't fold. 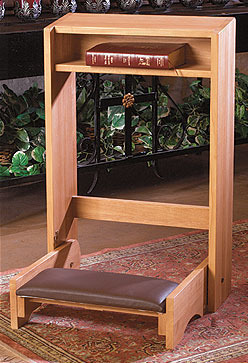 This gives it more stability, but makes it less convenient for storage or travel. 20 inches wide and 32 inches tall. $210 delivered to most USA addresses. Minor assembly is needed upon receipt.